Want to create a blog on WordPress? 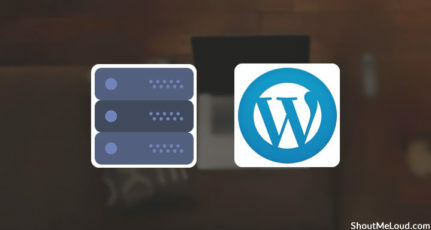 This guide is for newbies to learn how to install WordPress on Bluehost hosting. I have shared exact steps that would help you create your blog using WordPress. I have used Bluehost for my sites and my client sites, and what I like about them is they don’t oversell themselves. They’re simple, they’re innovating new stuff to make WordPress management easier, and they’re one of the best. Many of you might not be knowing the fact that, Bluehost is one of the officially recommended hosts by WordPress, which is a big deal. One thing I like about Bluehost is that they’ve scaled their server for optimum performance when running WordPress. They offer unlimited bandwidth, unlimited storage, premium support, and everything else you could possibly need to run a successful WordPress blog. 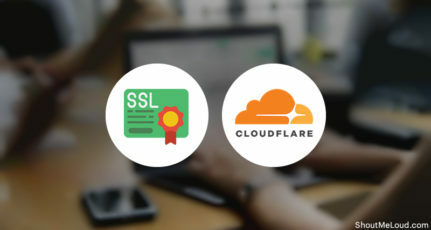 Recently Bluehost made some major improvements in terms of WordPress management and that includes you can use free SSL, WordPress will be auto installed and they made WordPress more secure on their server. The self-hosted WordPress platform is one of the best platforms to start blogging and making money. We have already shared a complete guide on how to start a new blog, and you can refer to that guide to get started. Bluehost offers a standard cPanel hosting, which comes with Fantastico. Fantastico is one of the easiest ways to install WordPress, or you can use the manual WordPress installation method. Though, I would suggest using Fantastico because it’s really easy and effective. If you’re still struggling to decide if Bluehost is right for you, I suggest to just go for it. It’s important that any WordPress web host meets certain technical requirements, and Bluehost perfectly meets these needs. It can handle any low-medium traffic site with ease. That said, I always recommend using a WordPress cache plugin when you are using shared/VPS hosting. 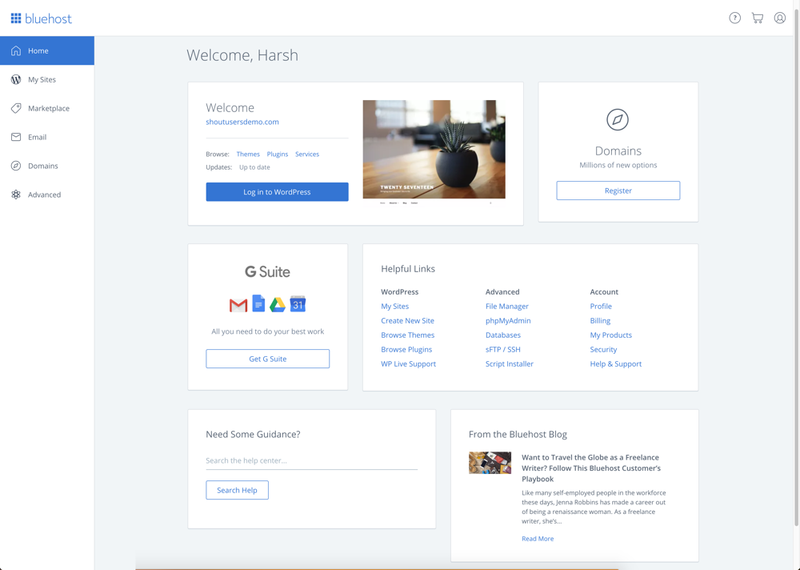 Assuming you already have a Bluehost account (if you don’t, get one here), you are ready to move ahead with this tutorial. Bluehost has completely revamped their web-hosting and made it WordPress oriented. 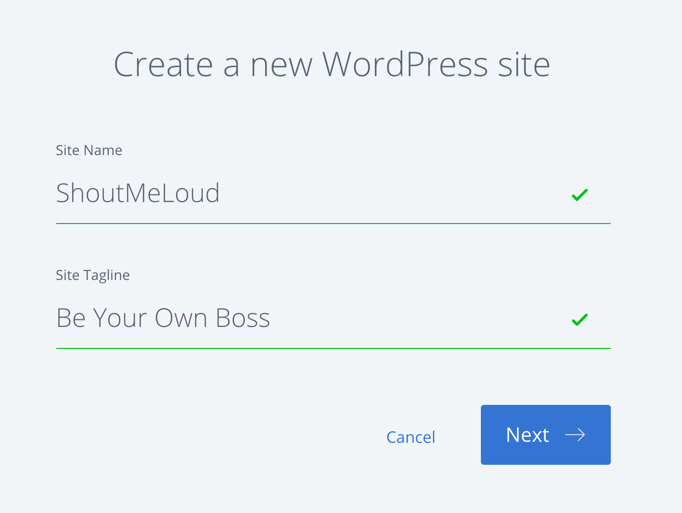 Unlike old times when you had to create your blog manually, these days Bluehost automatically install and setup WordPress for you. 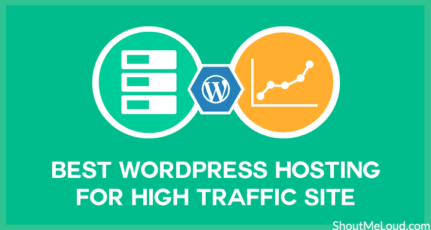 If you have followed the above guide and simply purchased hosting + free domain name from Bluehost, it will start installing WordPress for you automatically. click on Login to WordPress to automatically login inside your WordPress Blog dashboard. I’m creating few videos to help you understand the whole process. 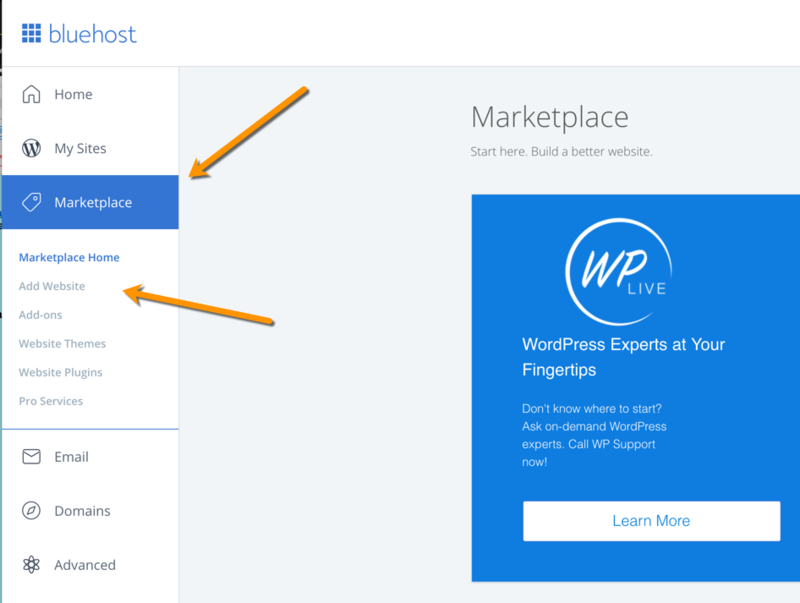 For now, this will help you to get started with WordPress on Bluehost hosting. Now, for some reason you deleted your existing WordPress installation or want to install WordPress on a new domain (Addon domain), you can follow the steps mentioned to do so. 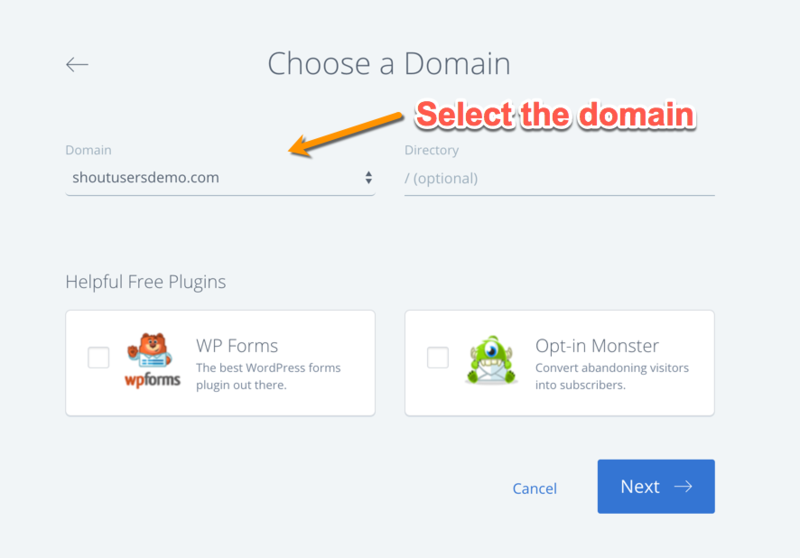 Click on next and select the domain on which you want WordPress to be installed. Click on next and WordPress will be installed on your selected domain within 5 minutes. Once WordPress is installed (on any host) there are a few things that you should always do. Let me know if you get stuck anywhere in the process. And let me know what you think about Bluehost. Share your thoughts and experiences in the comments below! Should I choose the Bluehost Indian servers or the US one? Most of my audience now are from India but I wish to grow internationally. Which one to choose please suggest. Bluehost USA is far superior than Bluehost India. Bluehost India is just rebranded version of reseller India and should be avoided. Nice article . I have one question..
Is it possible to change the hosting provider from godaddy to any other? If yes then is it 100% safe ? Please help me out. #Bluehost is really a good hosting company. Their support is very impressive. WordPress Site made with Bluehost opens up very quickly, compared to other hosting companies. I was thinking to change my Hosting service from Dollar2Host to Bluehost. After reading you’re posting about hosting service, I am ready to move with Bluehost. Thanx Harsh Sir. is Godaddy Hosting better than Bluehost? Please suggest me with which i should use. i am now using godaddy hosting. I have tried GoDaddy hosting and definitely its not as good as Bluehost. Bluehost is highly WordPress centric and offer better performance and tools to run WordPress sites. Thank you sir, for a great article. When do you know its time to move on to a higher end hosting package? What should you look for? Is it easy to move from shared hosting to another type of service? Thank you! It’s always easy to move from one hosting to another. Is it resources like Ram? When your existing hosting is causing issue and its not the error of WordPress or the platform you are using, that’s the time you should consider switching. Hi Harsh! I am just starting my blog and am totally in mess with all settings and plugins. A lot of them are giving problems. I was trying to do everything following your articles but still lot of things are not working. Will you be able to take out some time to help me start my blog? I have many questions. Could you let me know which plugin or settings are you facing issue with? I can help you fix them. Thanks for taking out time Harsh! Let me start by saying mine is shared hosting. I am using blue hosting but I dont know how my wordpress was installed automatically. There were no options for installing it there. Now the Bluehost is showing the comment they are provisioning the WordPress installation on a temporary domain, which is a bit confusing for me. My other problem is with some plugins. so I stopped trying installing them for a while. Akismet was not activating and was not giving me API key. One question is I wanted all the settings and plugins to be perfect before publishing my article. So, can I install all the plugins before publishing? Is it a good practice? Yah its a known issue and happens once in a while. Bluehost now offers automatic installer and I have checked and updated the guide with all important steps. Yes, you can and you should activate all essential plugins before publishing. This is another nice article from harsh agrawal. Bluehost is that the best and reliable internet hosting for beginning a diary. i’m also thinking that shifted to bluehost. This post is nice facilitate for me and others also. Nice article Harsh sir. Will this hosting provide me good realtime ? by the way keep up the good work. Oh yeah! Bluehost offers great uptime. One of the best in shared hosting space. I want to ask that sir which is better hosting hostgator or bluehost. part4 essentials things to do after installing wordpress is really helpful for me thank you so much and please tell me which hosting is better? Opt for Bluehost for hosting WordPress site as they offer free SSL. For other platforms (which is not WordPress specific), you can consider either of them. Here is one piece of advice for you: If shared hosting is handling your site perfectly fine, then no need to upgrade to cloud package or any other. My question is, is bluehost reliable and how many sites we can host on it and also they providing us email service related to domain. Depending upon plan that you select, you can host limited or unlimited website, depending upon the kind of website you are running. They do provide free domain email service as well. Hello Harsh, how are you? Thank You for giving information, Can you tell me Bluehost offers free SSL + WordPress tools because I want to start free digital marketing blogging for a beginner. Please recommend me which is best now. They do have WordPress tools which is pretty useful. 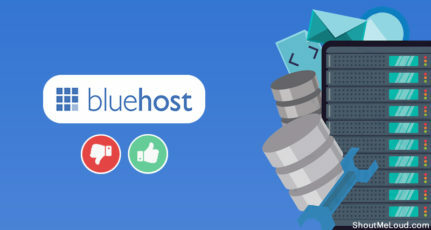 Go for Bluehost and you wouldn’t regret it. I want to ask that sir which is better hosting host gator or Blue host and which website is provide offers free SSL with word press. This is nothing to be worried about. The reason for showing this comment is because it takes a while for your chosen domain to become registered. It takes a day or two, and sometimes much quicker. Go ahead and start working on your site and when the real domain is ready, it should work automatically. nice article. I have a doubt about SSL certificate. I have not purchased the certificate at the time of hosting but I want it now. now, where can I find a certificate and how I install it.? If you are on Bluehost hosting, you don’t have to purchase it. Just follow the steps mentioned in the above tutorial and you will be able to setup free SSL certificate. It is a very informative article. I also think to move on Bluehost. is that secure for WordPress? yes, it is absolutely secure.